The extensive procurement programmes for the renewal of equipment for the armed forces all over the world are based primarily on established and therefore mature technology. The ever-increasing volume of regulations and rules must be broken through in order to make the required material available quickly. 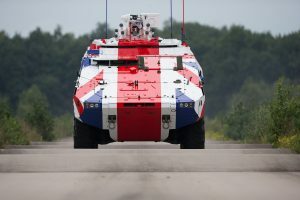 These are two findings from the International Armoured Vehicles Conference 2019 organised by IQPC, which brought together around 600 experts to exchange information at the end of January in London. Speakers from the armed forces presented their organisations and doctrines, findings from missions as well as moderni­sation and procu­rement program­mes. The industry presented approa­ches and propo­sals for solutions in lectures and an accompanying exhibition. The exhibition was also a focal point for discussions arising from the more than 70 different lecture topics. The actual conference was preceded by a focus day for maintenance, modernization and operation. In two parallel lecture se­ries, military leaders of numerous armed forces from all over the world explained aspects of the operation of their vehicle fleets and the industry had the opportuni­ty to present solutions for selected tasks. The main conference was moderated by General Sir Adrian Bradshaw. High-ranking NATO commanders presented require­ments for modern equipment for ground troops. The reduction of the logistical foot­print and signature was also crucial for command posts at higher levels. Invisibility is the important goal, also to be achieved by dispensing with extensive technology. The troops had to be enabled to use their weapons effectively at any place at any time. The refocusing on intensive combat required the troops to be quickly equip­ped with adequate equipment in sufficient numbers. A special focus was given to the GTK Boxer armoured transport vehicle for which OC­CAR, NSPA, the user nations Australia and Lithuania and the manufacturer ARTEC gave an overview of the procurement pro­gramme and the in-service phase. OCCAR procures the vehicles on behalf of the user nations (not for Aus­tralia) from ARTEC, the joint venture of Rhein­metall and Kraus-Maf­fei Wegmann + Nex­ter Defence. Today, 716 GTK Boxers in 14 versions have been ordered. Germany has ordered a second batch with 131 Boxer A2 group transport vehicles and Lithuania as new customer 89 infantry and two driving school vehicles. The 500th Boxer has just rolled off the pro­duction line. Australia has ordered 211 Boxer and 14 additional mission modules in five versions as part of the Land 400 modernisation pro­gramme. Of these, 25 vehicles known as Block I (12 reconnaissance vehicles and 13 multi-purpose vehicles) are to be put into operation by 2020 as immediate require­ments. The remaining vehicles will then be realized as Block II with the versions reconnaissance (121), command and con­trol (15), joint fire support (29), repair (11) and recovery (10). The reconnaissance ver­sion is equipped with a Lance turret with 30 mm cannon. For the variants withoutturret, additional mission modules are procured which are made transportable with ISO container frames. Two container frames are equipped with power supply so that mission modules can be operated sta­tionary in operation or in training (without driving module). The Block II vehicles differ from Block I in the integration of Spike anti-tank missiles, a mobile camouflage system, mine and ballistic protection according to Land 400 specifications, a new C4ISR command and reconnaissance system and possibly an active protection system (APS). On behalf of Australia, Rheinmetall is conducting a feasibility study to determine whether an APS such as the pre-selected Iron Fist can be integrated into the Boxer. The Block I vehicles will be retrofitted to the Block II configuration. In Europe, negotiations for the procure­ment of 48 Boxers in four versions for Slo­venia are in the final stage. Great Britain, one of the initiators of the Boxer program − but retired in 2003 − has rejoined the pro­gram and wants to procure more than 500 vehicles. The decision will be made before the end of this year. Since the British Boxers are to be produced predominantly in Great Britain, the industry is currently bringing itself into position. On January 21, 2019, Rheinmetall and BAE Systems announced that they intended to form a joint venture to produce a substantial part of the Boxer‘s production and to develop further whee­led vehicle activities. Rheinmetall‘s UK subsidiaries Rheinmetall Defence UK and Rheinmetall MAN Military Vehicles UK will also play a role. In Germany, there is a further demand for boxers to carry a heavy weapon for infantry operations and air defence with a number of units in the order of 90. The Netherlands has registered a demand for five vehicles and additional training equip-ment. This results in a total foreseeable produc­tion volume of well over 1,500 vehicles. The NATO Support and Procurement Agen­cy (NSPA) expects up to 2,000 vehicles for which it can provide operational support. Since 2013, NSPA has been working clo­sely with OCCAR to provide support in technical matters, material management, financing and procurement. Current­ly, 474 boxers are supported by the Land Combat Vehicle Support Partnership. The user nations benefit from NSPA’s expertise. Without specific user requirements, the in­dustry creates mission modules for further tasks. A bridge layer with a 14 m bridge (MLC 100) or 22 m bridge (MLC 50) is in prototype status. A mission module with a 155 mm howitzer is also in the experimen­tal stage. Numerous expectations have al­ready been fulfilled during test firing with the remote-controlled cannon. However, with a total weight of 38.6 tons, the weight of the howitzer requires changes to the suspension and other tires. ARTEC named the DSEI 2019 or the Eurosatory 2020 as possible presentation dates. The Boxer has grown into one of the most successful 8×8 wheeled vehicle ranges. The bundling of user interests in one or­ganisation for procurement (OCCAR) and one for operation (NSPA) each, which cooperate with ARTEC, in which the in­dustrial activities are bundled, is proving to be advantageous. The clear interfaces and unambiguous responsibilities enable the rapid and low-error realization of vehi­cles in accordance with military require-ments. The U. S. Army will renew its fleet of com­bat vehicles over the next few years. To accelerate development and procurement projects, the U.S. Army established the Army Futures Command (AFC) last fall, in which eight Cross Functional Teams (CFT) coordinate the work of the project teams as a Team of Teams. One of these is the Next Generation Combat Vehicle (NGCV) CFT, which reduces or closes the gap in cross-domain capabilities for the Army. For the AFC, the CFT serve as the primary in­tegrator for all supporting analyses, model­ling, simulations and technical demonstra­tions. The NGCV CFT Director synchronizes the capability building process on behalf of the AFC and quickly transfers the capabili­ties approved by the Army leadership into the Army’s procurement system. Five projects are assigned to the NGCV CFT. The aim is to quickly introduce com­bat vehicles that exceed the performance of the imported vehicles while reducing vehicle weight and logistic footprint. Long-term superiority for operations in futu­re combat environments with increasing threats is one of the decisive goals. 4×4 multipurpose wheeled vehicle, 50,000 pieces required, in production, fielded, ma­nufacturer: Oshkosh. Support vehicle on track, need 3,000 units, demonstrators under test, order first lot expected 2019, to be fielded from 2021, manufacturer: BAE Systems. Light tracked vehicle for heavy weapons, demand 504 pieces, demonstrators in pro­duction, manufacturer selection and deli­very order 2022, to be fielded from 2025, supplier: BAE Systems and General Dyna­mics. Infantry combat vehicle on chain, need size 4,000 pieces, competition beginning in 2019, to be fielded from 2026, supplier: BAE Systems, General Dynamics, Rheinme­tall/Raytheon. In addition, there is the incipient study ac­tivity for decision-making in 2023 on a futu­re heavy weapon (Future Decisive Lethali­ty, OMT/NGT). For the replacement of the Abrams main battle tank, a new platform will be sought that will ensure the decisive superiority of the effects. The prerequisite is the availability of mature technology for a leap in performance. One of the most interesting innovations was the future amphibious vehicle pre­sented by the representative of the Japa­nese Acquisition, Technology & Logistics Agency (ATLA). In a five-year program, a prototype has been under development since 2017 and will be subjected to initial functional tests in the second half of 2019. The decisive feature is the 2,000 kW drive motor, which, in combination with a speci­al transmission and two water jets, enables the vehicle to achieve a high (unspecified) water speed. An indication of the high swimming speed is also provided by the powerful surge board, which stabilizes the swimming position. The system technology for high water speeds is currently the focus of development. On land, the vehicle mo­ves on a track with six rollers. In addition to the driver and commander, the protected interior offers space for an infantry group. The main operational area will be the sea area with the Ryūkyū islands south of the Japanese main islands, in order to guaran­tee the safety of several thousand islands. Active protective systems are the means of choice for protection against rocket-dri­ven hollow charge projectiles. Rafael and Rheinmetall Active Protection (RAP), two renowned manufacturers of active protec­tion systems (APS), were represented at IAV. Rafael presented the Trophy, which had already been fielded and tested in combat, and is currently being integrated into U.S. Abrams main battle tanks. Ger­man Leopard 2 main battle tanks will soon be equipped with Trophy. In 2022, the first of these should be usable for subsequent deployment at VJTF. RAP will integrate its ADS on the Stryker of the U.S. Army befo­re the end of this year and carry out tests under operating conditions in the USA. For users, the operational reliability of the APS is of paramount importance: the system must trigger safely when a threat is detec­ted, but only then. This places high de­mands on the software. Rafael reported on up to two major software updates per year. The complexity and the high reliability, ho­wever, also demand their price. A sum of €1 million per vehicle was mentioned as the order of magnitude. The development of military armoured vehicles is progressing only slowly. After all, complex equipment has to be designed, tested and produced that has to function reliably in a difficult environment. Last but not least, they also have to comply with comprehensive and not always coherent specifications, regulations and rules, the scope of which is constantly increasing. The acceleration of these processes, which are currently measured in decades rather than years, is the concern of most players in the armaments community. The Interna­tional Armoured Vehicles Conference con­tributes to this through its external view and the exchange of information at a high technical level.